Looking for a cheap ticket to London? 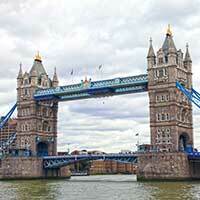 Here you can search all major low-cost airlines for cheap flights to London. Before you book a flight you can use Utiket to find the cheapest flights to London for British Airways (BA), easyJet (U2), Emirates (EK), Ryanair (FR), Turkish Airlines (TK). All flight data are real-time and accurate. Follow the links to search and book your cheap ticket to London directly with the airline or one of our partnering travel agents. The metropolitan area of London is being served by several airports: London Luton Airport, London Gatwick Airport, London City Airport, Heathrow Airport, London Stansted Airport, London Southend Airport. You can find more information or the cheapest tickets to all these airports here on Utiket. London Luton Airport is an international airport located about 50 km north of London. Luton is mainly used as a low-cost airport and is a base for EasyUet, Ryanair, Wizz air and Monarch with most of the flights to destinations in Europe. The airport is with close to 15 million passengers a year the fifth busiest airport in the United Kingdom. Read more about London Luton Airport. The Gatwick Airport or also known as London Gatwick is a large international airport. With over 40 million passengers a year it is the second busiest airport in the UK, after Heathrow and in the top ten of busiest airports in Europe. Read more about London Gatwick Airport. Read more about London City Airport. Heathrow Airport is the largest of the six airports around London and is with nearly 80 million passengers a year in the top ten of the busiest airports in the world. Heathrow is the base for British Airways and Virgin Atlantic and is located about 23 km west of central London. Read more about London Heathrow Airport. London Stansted airport is one of the international airports serving London and a base of several low-cost airlines including Ryanair which serves 130 destinations from Stansted. The growth of the low-cost airlines have made Stansted the fourth busiest airport in the country, with 24 million passengers a year. Read more about London Stansted Airport. Read more about London Southend Airport. This is a list of all airlines flying to and from London and how many flights and destinations they serve. You can see a complete list of airlines and flight options to London. Need place to stay in London?